If you haven’t already received a confirmation email from us with the dates & details of your pork | ham | bacon, it is too late! We will keep you posted on our next availability. Well we have been a little quiet the last few months, we settled into a bit of a rhythm going to Willie Smiths market every fortnight, eventually going every week with the Huon Producers Network. We sold our last 2 litters of pigs in September and we were waiting while our next 2 litters grew up ready for market. Well, now that time has come, and it is just in time for Christmas, so we have a very special offer for you all! For any orders placed prior to Saturday 17 November our standard cutup will include a bone-in smoked Christmas ham instead of bacon. If you still want our tasty bacon for that Boxing Day breakfast (or as a gift for the hard-to-please carnivore in your life) we can include that as well for an additional $25. 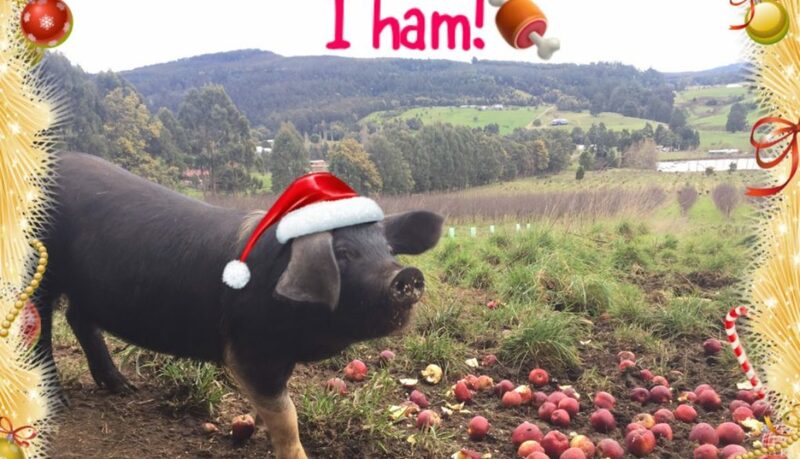 If this sounds like all kinds of delicious go onto our order page here and secure your Christmas ham today before they are all gone! March orchard pork now available! Come see us at Willie Smiths!